By the time we were up on Saturday morning, there were no signs of the previous evening’s festivities on board the ferry. No sign of anyone having gone overboard, in more ways than one! Everything was ship shape and Bristol fashion, and the winner of the vodka drinking competition no doubt safely tucked up in his cabin for the day. I wonder what the winning prize was, no doubt a bottle of vodka. The ferry berthed in Tallinn, the capital of Estonia. From the deck of the ferry you could see fairy tale towers and church spires, and the high stone walls enclosing the old town. It’s an old Hanseatic port, and many of the buildings date back to the 13th and 14th centuries. 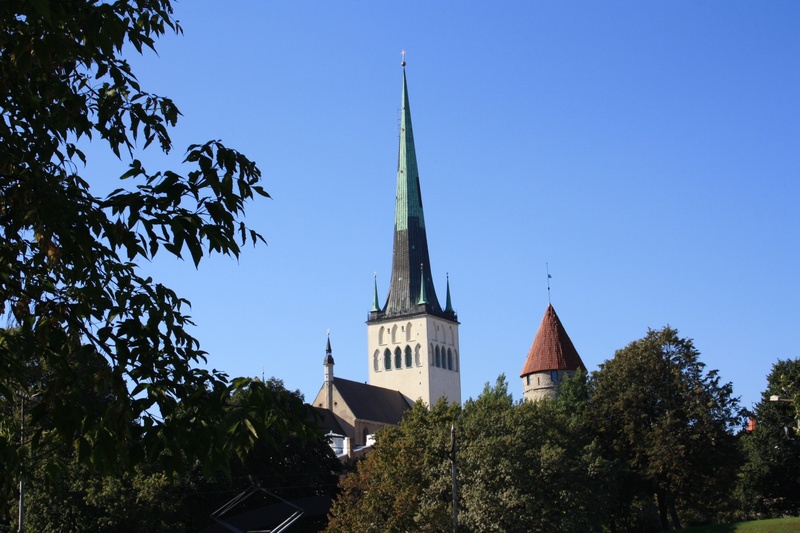 I read that at that time Tallinn was subject to the laws of Luebeck in Northern Germany, and you can see the Germanic architectural influence. But control of the city had clearly changed regularly over the centuries as there is a mixture of different influences to be seen. 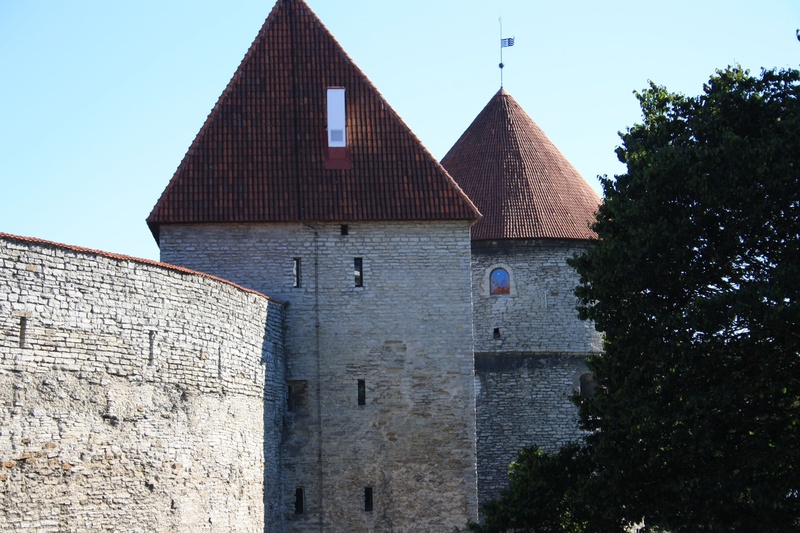 There’s a clear Scandinavian influence in many of the buildings, and of course since the 18th century there have been long periods of Russian control. We walked up cobbled streets, and alleys until we reached the top of a hill. We sat in the gardens of the Estonian Parliament, a very stylish building, pink in colour, which had been built in the 1920’s when Estonia first gained its independence. 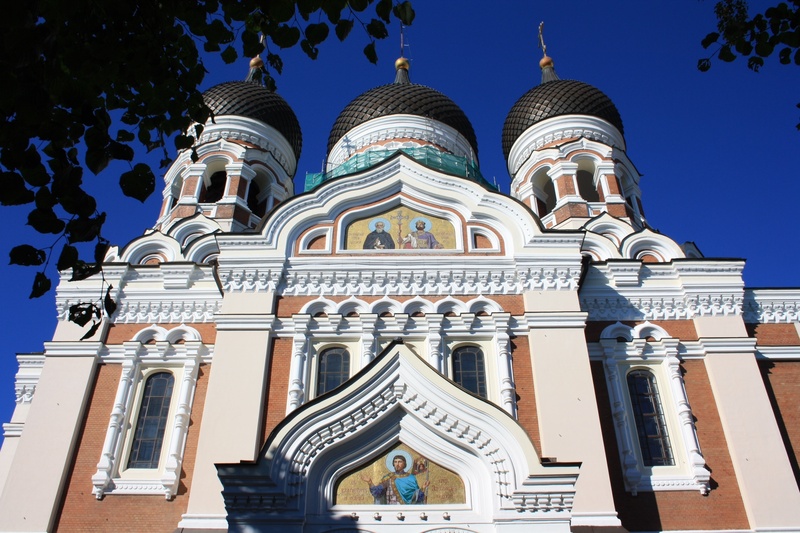 Opposite the Parliament, is the beautiful Russian Orthodox St Alexander Nevsky Cathedral, with its onion spires, shining in the sun. Jane would have loved the style – this is what I had seen in so many of her paintings. I realised that after more than a week of travelling across Europe, our final destination of Russia was getting very close. I think we took more photographs that afternoon than in any other of our stops. It was just such a beautiful place, or perhaps it was just the surprise of stumbling on this little jewel of a Baltic city, when there had been no such expectations that we would encounter anything particularly special. All too soon it was time to head back to the ferry, for the evening’s people watching, and to find out whether the winner of last night’s vodka drinking competition was up for repeating his success. Tomorrow and at last we would be in Russia. I heard from Lorna that your website had been hacked into & was out of order. I confess I had not notices.You did well sorting out the problem. Now for your Russian adventure- Jane would have been thrilled.